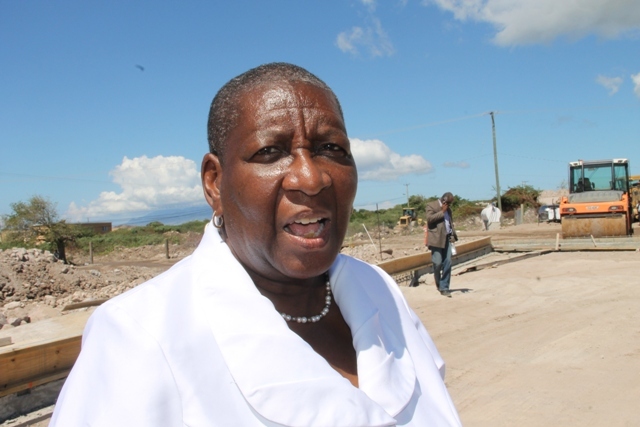 NIA CHARLESTOWN NEVIS (February 14, 2017) — Dr. Robertine Chaderton, Chairperson of the St. Kitts and Nevis Sugar Industry Diversification Foundation’s (SIDF) Board of Counsellors, expressed satisfaction with the status of projects funded by the Foundation in Nevis. Her comment came at the end of a tour of four project sites on the island on February 14, 2017. 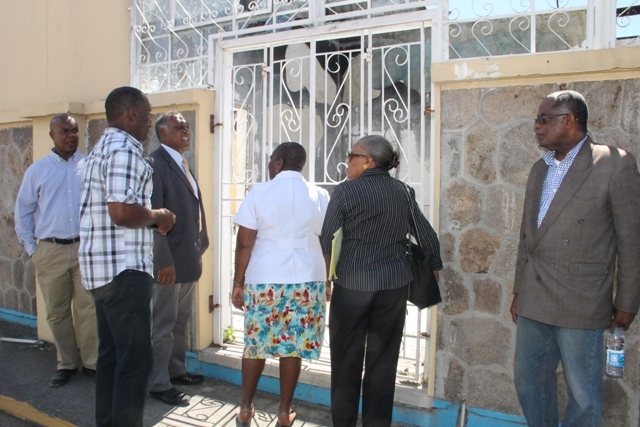 She was accompanied by fellow counsellors Delara Taylor, Leon Lescott and Secretary Mrs. Marguerite Foreman. Premier of Nevis Hon. Vance Amory and Permanent Secretary in the Ministry of Finance Colin Dore were also present. “I would think that from what we have seen, the money that we have provided has been well used and in every case, I asked about cost overruns and I have been advised that it’s not likely to happen. So they are going to come in on time and on budget. So we are quite pleased,” she said. The team visited the site proposed sites for the water taxi pier at Oualie Bay, the new treasury building in Charlestown and the Alexandra Hospital expansion project on Government Road and ongoing construction works at the Mondo athletic track at Long Point. To date, the SIDF has supported a number of projects on Nevis. It has disbursed $1,000,000 for the Alexandra Hospital upgrade, $500,000 to purchase equipment for the Long Point Port, $2,000,000 for Rehabilitation of the Vance W. Amory Airport Runway, $644,408 to purchase equipment for the control tower, $1,000,000 for the Water Rehabilitation Project, $5,000,000 for the purchase of a generator at the Nevis Electricity Company Limited, $6,500,000 for the construction of the 400 meters Mondo athletic track, $1,000,000 for the improvement of Sporting facilities and $10,000 to the Nevis Sixth Form College Literary and Debating Society for assistance with the 2017 Leeward Islands Debating Competition (LIDC) slated for February 23 to 26, 2017. The Water Taxi Pier and the Treasury Building projects have been approved for funding by the Foundation but funds have not yet been disbursed.